Three weeks into its new “Move Mountains” marketing campaign highlighting female athletes and role models, The North Face is having trouble halting a slide in key perception and revenue metrics with women, according to YouGov BrandIndex. The campaign seems to have prodded up The North Face’s ad awareness with women since the campaign’s early April launch, going from 3% saying they’ve seen a North Face ad in late March to a peak of 6% on April 18th, now down to 5%. The North Face’s ad awareness has reached 8% this year, but it is still too early to determine if “Move Mountains” will meet those marks. There has been little short-term effect on Purchase Consideration, YouGov BrandIndex’s metric of potential sales revenue. 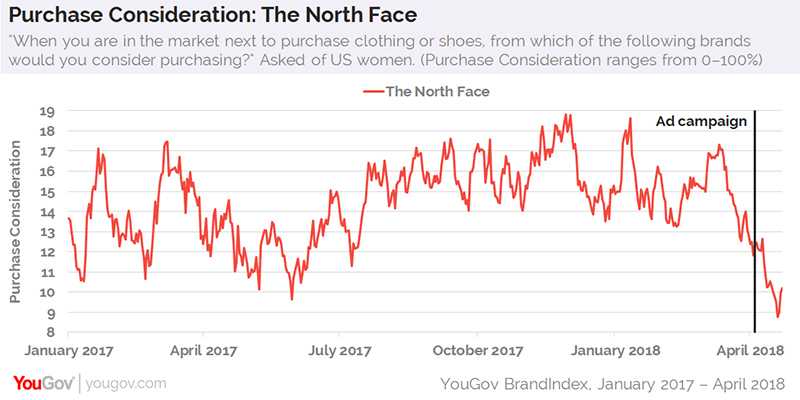 The North Face had been declining for several weeks: on March 13th, 17% of female consumers would consider buying from The North Face the next time they were shopping for clothes or shoes. The brand hit its lowest point in nearly 18 months on April 19th at 9% and just inched up to 10% this week.